Mullin Landscape Associates conducts training weekly, monthly and quarterly, plus it reimburses workers for extra education they receive. Quality work and the additions of new skills and services has helped Mullin Landscape Associates surpass expectations. Chase Mullin swore he would “never mow grass.” But today, the president of Mullin Landscape Associates does just that and then some. The $4.6-million, full-service company in New Orleans has continued to evolve since its beginnings in 2007. While Mullin is humble about his success, he credits his company’s growth to embracing diversification as needs changed and by never settling for anything but the best he and his crews have to offer. 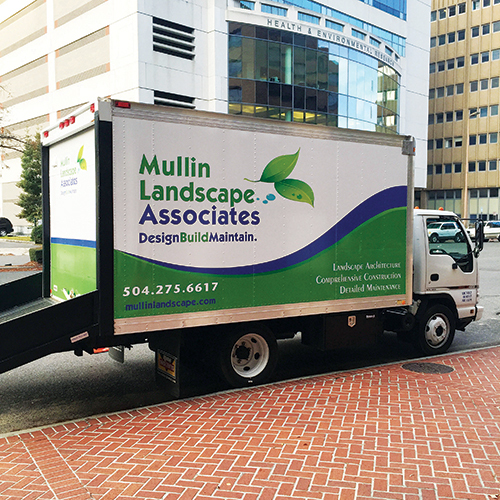 Mullin Landscape Associates adds new services, such as maintenance, based on customer demand. Despite a background in construction and a love of the outdoors, Mullin’s entrance into the landscape industry was slightly unexpected. After Hurricane Katrina devastated New Orleans in 2005, Mullin found himself working alongside a family friend who was using her landscape architecture skills to help rebuild the city. After gaining more experience working for a local full-service company, Mullin set out on his own with a Jeep, a trailer borrowed from a friend and 12 weekends of work lined up. Within three months, he was able to invest in a truck and a trailer of his own and employ a three-man crew. Mullin says he was fortunate with how quickly things ramped up. While he started out doing strictly plant installation and maintenance, Mullin quickly found diversification was going to be key to his company’s growth and success. Today, design/build and irrigation comprise 70 percent of his business, and mowing and maintenance make up the remaining services offered to his 80 percent residential and 20 percent commercial clientele. Adding mowing has helped Mullin Landscape Associates survive economic downturns and weather through tough times. This diversity also has allowed the firm to become a turnkey solution for all of its clients’ outdoor needs—one of Mullin’s greatest joys is seeing through a multifaceted project from start to finish. 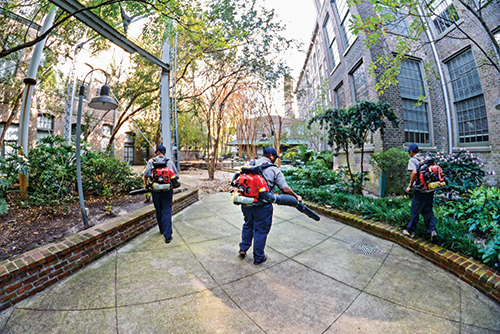 From pools and outdoor kitchens, to pest management and green roofs, there’s little his crews can’t do. Mullin adds that the New Orleans climate allows for an interesting mix of temperate, tropical plants and unique structural designs to match the city’s historical architecture. These bonuses let his designers’ creativity shine. Mullin Landscape Associates prides itself on taking projects from start to finish. These added services have increased Mullin’s need for high-quality employees. Finding them is one of the company’s biggest challenges. Mullin utilizes online and college recruitment services and has hired all his landscape designers from Louisiana State University’s top-rated landscape architecture program. In 2014, Mullin placed a renewed emphasis on employee training. He implemented weekly training sessions for all managers, a monthly training course for all production team members and more in-depth training for the whole staff on a quarterly basis. The company encourages ongoing education and reimburses team members for earning additional certifications and licenses, which Mullin says adds value to the employee as well as to the company. Implementing systems was another challenge Mullin Landscape Associates had to overcome to get where it is today. From consistent job descriptions to a scripted sales process, the systems ensure each employee does the job he or she is supposed to do the way it’s supposed to be done. Mullin established an executive committee of upper-level managers that meets once a week to ensure systems and processes are flowing and being implemented in predetermined time frames. The company also is working with several industry consultants to assist in systems development, which Mullin says has provided everyone a fresh perspective. But from day one, Mullin’s main mantra has been to always do the best work possible. From that first client’s early words of encouragement, he has strived to maintain a level of service that he can be proud of and that will keep his customers coming back.